Jaysons Realty (Pvt) Ltd (JRL), the real estate development arm of the Jaysons Group, launched its latest residential apartment complex, De Saram Residencies (DRS). With 22 apartments on 8 floors offering premium specifications to spectacular views to the Indian Ocean, this is the first step towards the greater development opportunity that will unfold in Mount Lavinia. "Our experience with the Little England Cottages allows us to understand how exactly to improve the living experience for residents thereby assisting the transition of making a house or apartment unit a home," explained JRL CEO Vasantha Jayasuriya. Project Manager Tarik Jayasuriya noted, "We have already 50% out of 22 units have been sold off plan via a 10-day social media campaign and we believe that all remaining units will be sold before construction begins in February 2016. The estimated date of completion of the apartment is 31st May 2017. The total investment is US$ 38 million. We will also launch two other similar product in Digana in Central Province and Colombo. 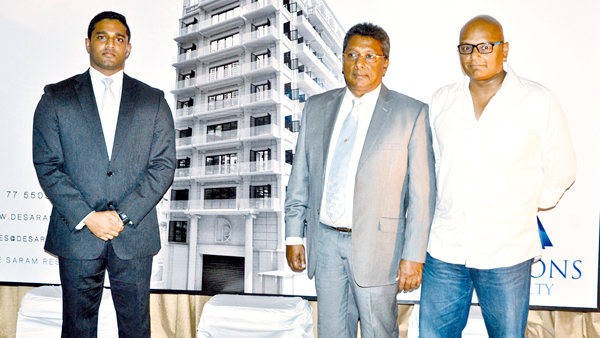 DSR is designed in collaboration with veteran condominium architects, Milroy Perera Associates (Pvt) Ltd and JRL. DSR is a Board of Investment approved project and has also received Urban Development Authority as well as Local council approval. The apartment on 21 percent includes special features such as glass balustrades running right along the balconies to ensure a spectacular view is maintained. "Over 10ft floor to ceiling height for better ventilation and living experience with large windows and doors is a unique feature in the complex. Some of the other unique features of the complex are the roof-top fitness area, swimming pool, garden and Barbeque pits. The project will be completed in May 2017. To guarantee top tier finished and construction the project will include a C1 grade contractor. The stone laying ceremony for the apartment complex was held on the January 17, 2016 and top professionals and potential buyers (both local and foreign) attended the ceremony. With over 20 years in the business Jaysons Realty (Pvt) Ltd (JRL), constructed the first and only 'Old English Cottages' replicated in the hills of Nuwara Eliya, known as 'The Little England Cottages'. Success with the luxury gated development in Nuwara Eliya.